Deus Vox Encounters (DXE) is a boss mod inspired by RDX. It is designed to be functional, efficient, and customizable, so you can change what you want and how you see this addon. Click here to donate to Deus Vox Encounters (DXE) your contribution will really help developing the addon. Also, if you ever hide the pane and can't get it to show, type /dxe to open the configuration dialog. There is also a minimap icon. 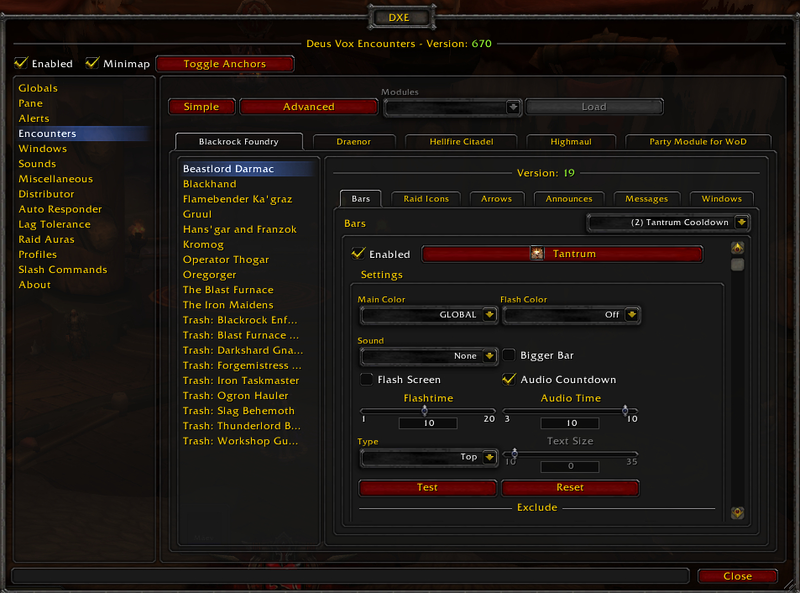 Encounters: Highmaul, BlackRock Foundry and Hellfire Citadel have been implemented. Party Module: Party support has been added. World Boss Module: World Bosses support has been added. Features: More new Alert Options and Spell descriptions on Options. Hey is the addon shut down or is an update for bfa in planning? Any news about the update for Legion ? /push I spent 20€ too, when i see an legion Update! I really hope DXE comes for Legion, I miss it from MoP and early WoD when I last raided! I sent a donation of €20, first time ever I do anything like that, that is how much I want DXE to continue on! Really hope @Maev81 sees this and considers this! When my raidleader starts a break, I only get a raidwarning, nothing from DXE at all. And to make things worse, he is using DXE as well. Anyone got any tip on how to make it work? Thank you so much for updating this - I've been REALLY missing this bossmod. Hey, forgot to mention this a while ago. Tyrant Velhari has 2 spell ID's for Edict of Condemnation because of the slow effect on the ability in mythic. So you want to add 185241 to the id's in a build for mythic otherwise the cooldown timer won't come up after the first one has gone out. Also the Nether Banish say on Archimonde for tanks has <EdictOfCondemnationSay> for some reason. I accidentally came across this when searching for edict in the entire folder instead of the velhari file. Finally a suggestion for the Hellfire Assault default settings, having an audio cue and screenflash for the "Incinerate: INTERRUPT boss!" alert from the Fel Casters gets a little spammy at times. I forgot I had disabled this but a guildy had installed DXE after I told him too and he said his boss mod wouldn't shut up saying "BEWARE! ", which was funny for us. Yesss, fixed with 674, thank you so much!!! Edit: With 673 version same error. I've been on PTR and got a couple of transcripts for you for the first 7 bosses. Also made a few basic timers while I was on there but some stuff seemed bugged within DXE. Not sure what they changed yet but I'll figure it out. Aha, ok I'll tinker about with it and will give it a test on Maidens tomorrow. 1. for iron maidens i added the new code dbm started to use because of a modification Bigwigs did on his core, basically Bigwigs added a sync event for Boss whispers. (that code is intend for his Transcriptor addon but usable) <- So because of this and because between the boss whispering a player on Iron maidens to its Aura_Applied is a flat 3 seconds delay, with that code will be instant and always the correct player. Will need testing of course. 2. As for raid break stuff i fixed it.